Recently, the office of the Attorney General publicly named the Chief of Staff of the Angolan Armed Forces, General Geraldo Sachipengo Nunda, a formal suspect for criminal association. More specifically, General Nunda was implicated in a US $50 billion scam led by a Thai businessman. However, the Attorney General later apologized for the “mistake”. The bungle has deeply troubled the Army and the judiciary, and has cast a shadow on President Lourenço’s anti-corruption drive. When General Hélder Fernando Pitta Grós was appointed to the office of Attorney General of the Republic by Angola’s new President, João Lourenço, in December 2017, public opinion was divided. On the one hand, there was disappointment that yet again a military figure would occupy what should be a civilian position. On the other, there was optimism that, after ten years under the jackboot of the truculent and controversial Dos Santos-appointee, General João Maria de Sousa, the country’s prosecuting authority might finally be under the control of a legal brain with sufficient zeal and credibility to reform a tarnished institution. Three months on, the new Attorney General has badly bungled the questioning of the army top brass in connection with an attempted US $50 billion scam and has been forced into a humiliating climb down, with both military and civilian critics calling for him to be sacked. The saga begins with a criminal investigation into fraud and money-laundering allegations against a Thai financier, Raveeroj (aka Roger) Rithchoteanan, of Centennial Energy Thailand, and his accomplices (*see footnotes), who are accused of passing a false financial instrument to an Angolan bank under the guise of facilitating developmental financing for Angolan projects. It’s alleged that a US $50 billion check from Centennial Energy was a fake aimed at persuading their supposed beneficiary partners to invest with them. The Centennial ‘philanthropists’ were invited to visit Angola by Celeste de Brito, a well-connected Angolan businesswoman. She now stands accused of complicity in the Centennial fraud, and of allegedly forging the signature of the current Angolan Vice-President, Bornito de Sousa, to obtain entry visas for Rithchoteanan and his associates. It appears the Centennial investment ‘pitch’ convinced a few Angolan business owners to part with some money. But their biggest target by far was an army-led cooperative named Ondjo Yetu [“Our House” in the local Umbundu language). The business was desperate for finance for a massive project to build social housing for hundreds of military and civilian personnel. As a result, the then director of UTIP (a technical unit within the Presidency to vet private investments), Norberto Garcia, enthusiastically supplied the backings. Consequently Centennial proposed a joint venture with the cooperative. At first, this move was hailed as the savior of nearly 700 unrealized projects, which had stalled for lack of funding. However, the proverbial rat was ultimately smelled. It turned out that the US $50 billion windfall was a mirage – the cheque deposited at Angola’s BNI (International Business Bank) never cleared. 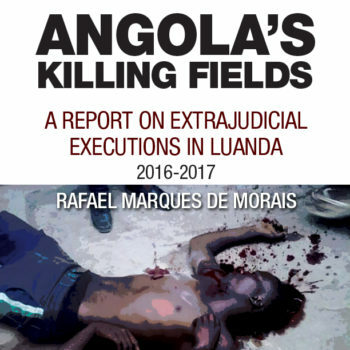 Old habits (and old fears) die hard in Angola after 38 years of the abusive and highly corrupt Dos Santos regime, during which connections to the ruling elite guaranteed impunity for various crimes. When the SIC investigators realized that Celeste de Brito was connected to Bornito de Sousa, they hastily passed the buck to the Office of the Attorney General of the Republic. It fell to the National Directorate of Investigation and Penal Action (DNIAP) to pick up the case and interrogate the “well-connected” suspects. And this is where the wheels truly came off the wagon. In obedience to President João Lourenço’s vow to crack down on corruption, the Under Director of DNIAP, Luis Ferreira Benza Zanga, excitedly revealed that not only had they made 12 arrests and had 70% of the evidence needed to convict, but among the formal suspects still awaiting interrogation were four Generals, including the Chief of the General Staff himself. Ultimate responsibility for the military housing project, though not its day-to-day management, lay with the Chief of the General Staff, General Geraldo Sachipengo Nunda. 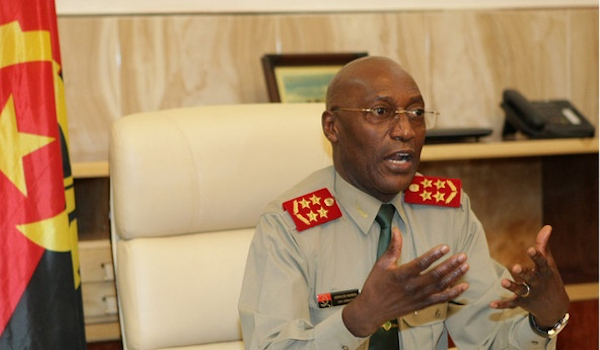 He is a former UNITA officer during the country’s long civil war, who transferred into the Angolan Armed Forces and has proven an able and much-respected commander, serving since 2002, first as Deputy Chief of the General Staff and then Chief. Having reached the age of 65, he has already announced he will retire when his term of office expires this October. Attorney-General Pitta Grós reportedly took it upon himself to tackle the veteran General Nunda in person, at the General Staff headquarters. According to the head of the Army, General Pitta Grós asked him to resign his position and subject himself to questioning in connection with the Centennial investigation. Insult was added to injury by Luis Ferreira Benza Zanga’s over-zealous announcement to the news media that General Nunda was a formal suspect in the now notorious case, and could face charges of criminal association, fraud and money-laundering. In the ensuing uproar, members of the FAA top brass and parliamentarians alike, called for the Attorney General to step down over his mishandling of the case, which badly backfired on his office. In trying to prove it would be ‘squeaky clean,’ General Pitta Grós’ office has now shown its impotence in the face of the MPLA’s military hierarchy. General Nunda responded to us at Maka Angola with his side of the story – a cautionary tale for our times. He reveals not only the names of the people he clearly sees as the real culprits behind this mess, but also the naiveté and vulnerability of Angolan institutions in the face of promised credits and funds from abroad. 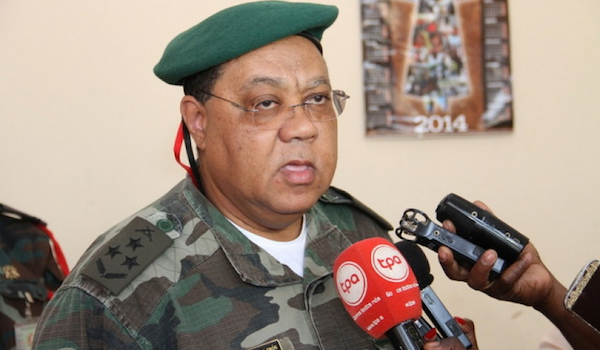 In his conversation with Maka Angola, quoted at length below, he starts by explaining how in 2015 the General Staff of the Angolan Armed Forces (FAA) set up ‘Ondjo Yetu’ to create much-needed social housing for soldiers and support staff. General Nunda says that when Brigadier Arsénio first briefed him on this subject, he was told the Thais had a fund of US $20 billion available. The Chief of the General Staff says he began the process of due diligence, calling the principal shareholder and Chairman of the BNI board, Mr. Mário Palhares, to set up a meeting with Brigadier José Arsénio Manuel, to verify the authenticity both of the Thai company and its check. The Brigadier subsequently brought the Thai partners and their associates to meet the Chief of Staff at his office on December 14, 2017. In the course of that meeting General Nunda says the Brigadier requested the return of the check deposited with the BNI. The excuse was that the BNI had not followed the necessary procedures to clear the funds and as a result they were not yet available. For its part, the BNI issued a statement on February 3, 2018 stating that it had referred the matter to the appropriate authorities after learning from social media that the BNI name was being used “inappropriately” by Centennial and its partners. The Chief of the General Staff also received written details of the agreement from the Brigadier and then referred these to his legal department for evaluation. He also took the precaution of sending a written briefing on the project and draft agreement to his Commander-in-Chief, President João Lourenço, who in turn passed it on to his Defense Minister, General Salviano de Jesus Sequeira, better known by his nom-de-guerre, “Kianda”. General Nunda left for the United States of America the following day to take part in the February 14-16 meeting of the military heads of the SADC nations at the United Nations in New York. Thereafter, he flew to South Africa to attend the South African Defence Forces’ anniversary celebrations. While in South Africa, he received word from General Altino Carlos Santos (head of the General Staff’s Planning and Organization Directorate and auditor of the Ondjo Yetu Cooperative) on February 21 that the Thai representatives of Centennial Energy had been arrested. Barely had he returned to Luanda that on March 3 General Nunda received the fateful visit to his office from the Attorney-General. “The PGR [Portuguese acronym for Attorney-General of the Republic] proposed to me that I should resign. I replied that I would not do so, because I had done nothing wrong and committed no crime,” said General Nunda. General Hélder Pitta Grós, the Attorney General of Angola. Defense sources say it was an extraordinary step for the Attorney General to have taken this action. Only the FAA Commander-in-Chief – i.e. the President himself – has the power to fire or demand the resignation of his Chief of the General Staff. There seems to be no doubt that General Nunda still enjoys President Lourenço’s confidence as he was given greater powers of oversight over the security and intelligence service within a day or so of the Attorney-General’s misguided overture. With a host of senior military and political figures lining up to condemn the Attorney-General for what they saw as the outrageous attempt to blacken the army chief’s name, the Office of the PGR issued a public apology for its “mistake”. The Attorney General has kept a low profile since, and has yet to offer an explanation of how such a “mistake” had originally come about. He has however scrambled to exercise damage control in the wake of General Nunda’s self-exculpatory statement and the outcry provoked by the suggestion that he might be a person of interest in the fraud investigation. Recently, on March 27, the now contrite General Pitta Grós reappeared at General Staff headquarters to apologize in person. Unsurprisingly, he did not find General Nunda in a forgiving mood. He was told to direct his apology to the 130,000 soldiers and 28,000 civilian workers who had placed their trust in the integrity of their Chief of Staff. Heaping further humiliation on Pitta Grós, General Nunda then dragged him over to the Defense Ministry to face Minister Kianda. Notwithstanding the Attorney General’s contrition, there is simmering anger in some quarters over what’s perceived as unwarranted heavy-handedness by Pitta Grós. His critics say that before the investigation was even complete, he behaved like a judge and jury and tried to impose a sanction that can only be ordered by the President himself. In fairness, the new Attorney-General, barely months into his job, has at least shown a Robert Mueller-like disinclination to be intimidated from doing his duty. Presumably the evidence amassed by the SIC and DNIAP aroused suspicions of collusion between the Thai conspirators and Ondjo Yetu. Unfortunately for General Pitta Grós, when there are so many crooked Angolan generals linked to corrupt dealings, he was supplied with the name of the one man against whom the mud simply doesn’t stick. A simple internet search is sufficient to cast some doubt on the credentials of the shady individuals involved in this affair. Centennial Energy Thailand’s website places the company in Chiang Mai. Yet the company’s founder Raveeroj Rithchoteanana, also known as Roger Rithchoteanana, registered a company with a similar name in London in December 2016: Centennial Energy (Thailand) Co. Ltd. 6, with a forwarding mail service in London as the company’s supposed business address. Roger’s sole co-director, the obligatory UK resident, turns out to be a Russian-born Israeli national, Polina Frimerman, first recorded as being in the UK in 2003. It is unclear to this point how they initially connected. Raveeroj/Roger was born in 1967 in Thailand, Polina in 1982 in Russia. He apparently lives in Chiang Mai, while she is listed on the electoral roll as living in Nottingham and apparently is employed by The Sherwood Institute. Polina, however, has a much more sordid past, namely a six-year history of involvement in failed companies. Records show that she registered her own company, Frimer Capital Ltd. in September 2012, but its annual reports betray little profitable activity. Its capital has never risen much above £7,000, its debts always outweighing its assets. As of 2017, it had a reported negative net worth of -£690. Simultaneously, between 2012 and 2013, she was listed as Company Secretary of Nottingham-based Nova Extractions Services Ltd. owned by another Russian national, Dr Alexander Novitskiy. That company has enjoyed slightly more success – mostly since Polina’s resignation. Nonetheless, a Russian national named Kakadzhan Annamuradovich Omarov somehow selected Ms Frimerman to be his co-director in a company named Mega Torg (UK) Ltd. That company also failed to thrive and after a mere 16 months was wound up on November 28, 2016. At that point Ms Frimerman was listed as resident at 22 Fletcher Gate, Nottingham. How surprising then that a mere two weeks later, Ms Frimerman pops up as co-director when Mr Rithchoteanan registers the UK version of Centennial Energy Thailand on December 12, 2016. Their business address is given as 20-22 Wenlock Road, London N1. This is an address that pops up frequently on the Companies House register because, among other things, it supplies onward mailing for those who have reasons not to list their real addresses. Once again the business is short-lived, and within a year they apply to have it dissolved and taken off the UK company register, although in the process they supply a change of address. Unsurprisingly it’s the same Nottingham address (22 Fletcher Gate) used by Mega Torg (UK). As of April 3, 2018 Centennial Energy (Thailand) Co. Ltd. 6, has ceased to exist. And what of Raveeroj/Roger Rithchoteanan the Thai businessman apparently able to conjure up US $50 billion to rescue Angola? His biography says he was first employed with Central Element (Hong Kong) Ltd. and Central Element (Cambodia) Ltd., two companies that it has proven impossible to trace other than two ghost pages on Facebook. He then pops up as a self-described multi-million dollar financier facilitating projects in South East Asia, though it rapidly becomes clear that he is not providing the actual investment, but simply offering to act as a broker. In fact, despite the memorandum of understanding signed with Centennial that deep sea port in Myanmar has yet to be financed or built. There are tantalizing mentions of Mr Rithchoteanan in connection with what turns out to be a fake news story, involving the late Ferdinand Marcos signing away hundreds of tons of stolen gold with the proceeds being sent to Centennial Energy Thailand to facilitate the secret printing of hundreds of millions of US dollar bills in the Philippines. The words “money laundering” appear in connection with his name. And yet he portrays himself as a fabulously wealthy philanthropist, the head of an eponymous World Foundation that requires a US $200 billion budget for the year to achieve what his website calls “quite a Big Hairy Audacious Goal”. Named suspects arrested and/or questioned by Angola’s SIC and DNIAP. Celeste Marcelino de Brito António, Angolan national, aged 45 chairman of Natrabank and Tamara, owner of Celeste de Brito Lda. (Natrabank is located in one of the condominiums built by UNIPREV under Brigadier José Arsénio Manuel. Monthita Pribai (or Pribwai)– Thai National, alleged to be Rithchoteanan’s spouse. Agência para a Promoção do Investimento e Exportações de Angola, APIEX – Agency for the Promotion of Investment and Exports from Angola.